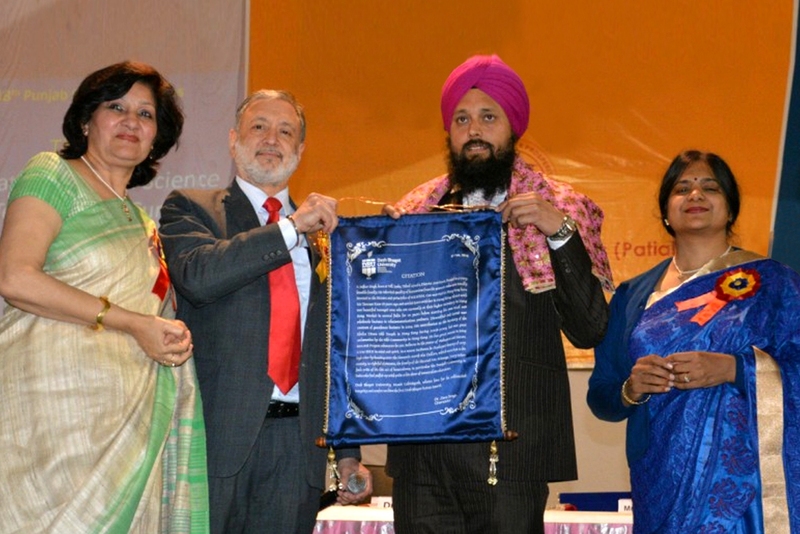 Mr. Jujhar Singh alias Jimmy Khalsa, an NRI based in Hong Kong has been honoured with first ‘Desh Bhagat Rattan Award’ for his exemplary honesty. The award was conferred on him by Desh Bhagat University Chancellor Dr. Zora Singh and Pro Chancellor Ms. Tejinder Kaur during a special function arranged in the university. Speaking on the occasion, Dr. Singh said that Jujhar has proved that if you are honest and faithful to your conscience, then nothing can tempt you to do anything wrong. Jujhar is an idol for the youth and with his immaculate character, he made all Punjabis and Indians proud in the whole of Hong Kong, he added. It is worth mentioning that Mr. Jujhar Singh returned the diamonds and precious stones worth one lakh Hong Kong dollars to its rightful owners. Pro Chancellor Tejinder Kaur said that we want to inculcate such spirit of honesty and integrity among the students. After receiving the award, Jujhar became emotional and thanked the university management for honouring him. He observed that he is walking on the path of honesty which has been shown to him by his respected parents. It is worth mentioning that Jujhar is running a mobile shop in Hong Kong, where Mr. Nimaga, a business man of African origin, used to visit him whenever he was there. One day, Mr. Nimaga went for prayer and left a bag there. Later Jujhar Singh came to know that Mr. Nimaga had a silent heart attack while praying at a mosque and was declared dead. When he checked the bag, there were precious stones worth One Lakh Hong Kong Dollars in it. He did not know anything about the whereabouts of Mr. Nimaga and his family. But showing his integrity, he made efforts to find out the rightful owners of the bag with the help of some locals and handed it over to them.